Climbing and access information for this peak is found on page 223. White Cloud Peak-8 (WCP-8) is one of 10 numbered peaks, denoted as “WCP-#” in the White Cloud Range. WCPs 1-10 are part of the Northern White Cloud Peak Group (page 220). All 10 are spectacular peaks! WCP-8 is a broken pile of rubble, south of Ocalkens Lake, that sits between WCP-7 and D.O. Lee Peak. WCP-8 is seldom climbed. 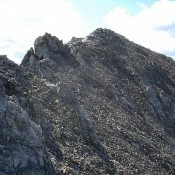 The book provides route information for the peak’s South Ridge. Below, find Livingston Douglas’ route up the North Ridge. I climbed this route on 8/31/16 along with WCP-7 and White Cloud Pyramid/Peak 10182. From the ridge saddle south of WCP-7, scramble south along the ridge, up and over Point 10244 (Class 2 so far). At this point, the ridge becomes choppier, but it is still an easy Class 3 scramble. Goat trails will help you work your way along the ridge crest and keep you to the climber’s right of a few rocky ridge outcrops. The final section of the North Ridge is Class 3. 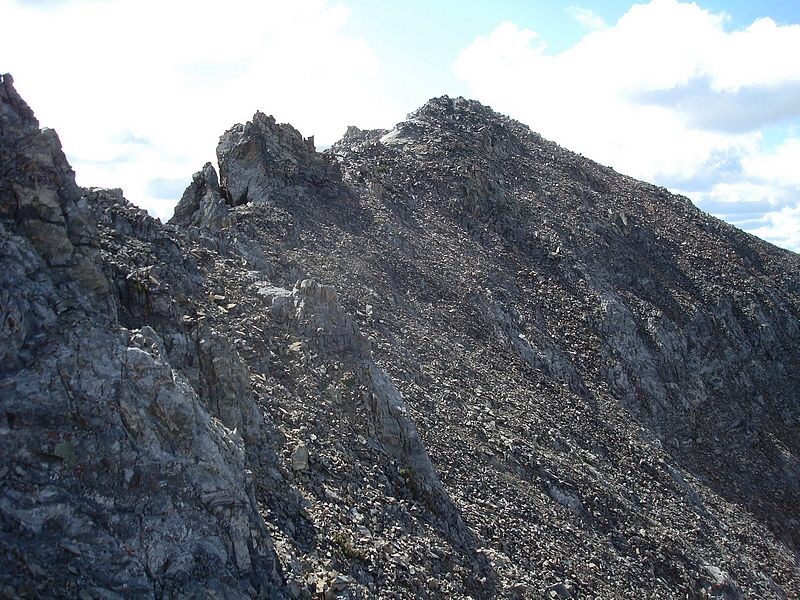 The summit of WCP-8 is the high point (a slanted rock fin, actually) that marks where the ridge turns left (east). The exposure on the east side of the ridge is consistently breathtaking. Avoid it by staying on, or just west of, the ridge crest (Note: the ridge itself is NOT a knife-edge). To descend, return the way you came. If you can spare an extra hour, climb the beautifully-pyramidal Peak 10182 (White Cloud Pyramid) just to the west of Point 10244 on your way back to WCP-7.